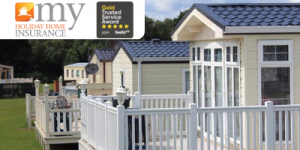 Static Caravans can be both a great home to live in or a place to escape on holiday. However, like all homes regardless of structure, you will need to maintain it. Proper maintenance of your caravan will extend it’s life meaning you can enjoy it for longer! So what do you need to do to ensure that your caravan is well maintained? 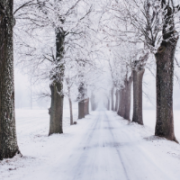 Make sure that you protect your caravan during the winter months. You should “drain down” the caravan, so that the water and heating systems will not be damaged by the cold when you are gone. Turn off the supply of water and gas before you locate the external water drainage plugs. Once you have started to drain the water, you can turn on all of the taps and leave the inside plug holes open – just to make sure that there is no water left in the system. 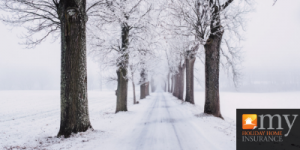 You can also use compressed air to blow through the pipe-work, just to make sure that there is no remaining water that could potentially freeze. You might also want to use a solution that is three parts water and one part anti-freeze. Put it through the drained system to further waterproof it. It is also important to check the roof of your caravan for faults and blockages in the drainage system. Make sure that you remove all debris from the roof, such as rotting leaves and degrading matter. It is a good idea to blast the exterior with a pressure washer, or use a cloth and some soap to wash it down. This will help to avoid any damage caused by debris and build-up. Always keep an eye on your caravan and inspect it frequently for rust and corrosion – especially if you own an older caravan. It is also very important to make sure that your gas boiler is serviced annually – because if the boiler breaks while you are away from your caravan for the season, a lot of damage can be caused. If your caravan uses a butane cylinder, you should watch out and make sure that the sealer washers do not need replacing. Another important factor to consider is the security of your caravan. Make sure that all of the doors and windows on the caravan have security devices – and you may even want to consider investing in an alarm. It is advised that you take all contents of worth home with you if your caravan is for holiday use. 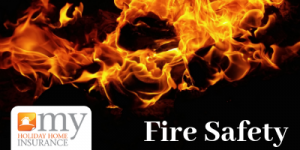 Whether your holiday home is being Let, used by you, or a guest, fire safety in your holiday home is essential. There are some important safety checks to consider and although it will not completely eliminate the risks, it will help to reduce it. We all know how devastating a fire could be, you could lose everything or worse, someone could get injured. Everyday things we use such as kitchen appliances and open fires come with their own risks, so you should monitor them frequently. 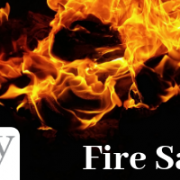 Here are a few general tips on what you could do to reduce the risks of a fire in your holiday home. If you are letting your holiday home out, you should have a fire risk assessment carried out regularly so that you can identify any potential hazards. This way you can take the relevant precautions to minimise the risks and keep your guests safe. Display a fire notice so any guests know what to do if there is a fire. Cooking appliances can cause fires, so there are some things you can do to reduce the risks. Clean the appliances regularly, so any built-up fat or grease is removed, as this could pose a fire risk. Check appliances regularly so that any sign of damage can be repaired or replaced. If you are letting out your holiday home, keep a fire blanket that is easily accessible. Using water on some fires can act as an accelerant so avoiding this all together is a better alternative. You should keep appliances such as toasters or grills as clean as possible. Remove anything that could cause a fire such as crumbs and keep them away from areas that can catch fire easily, such as curtains or cloths. Electrics that are faulty can cause fires so make sure that all your equipment is in safe and good condition. Try not to use too many plugs in one socket as this could overload the socket and cause a fire. Open fires and log burners are very attractive feature inside a holiday home, giving you that feeling of cosiness, however they do increase the risks of a fire. Sweep your chimney annually and use a fire guard to protect you from burns. Be wary of hot ash and dispose of it appropriately outside the property. Fit and maintain a smoke alarm. A smoke alarm can save lives, so be sure to test it at least twice a year to make sure it is in good working order. Put your smoke alarms in the right place inside your holiday home, so not too close to the kitchen where you can set it off accidentally and it becomes a nuisance. This way, when it does go off you know that it is a real warning. If your holiday home has more than one floor make sure you install alarms on each landing. These are just a few things you can do to protect your holiday home from fire but there is a lot more, so speak to your local fire department for further information. For similar information or tips on Holiday Homes, please follow us on Twitter, Facebook & LinkedIn. Keeping your holiday home safe and secure may not be at the forefront of your mind: it’s easy to think that an idyllic, rural location is virtually crime free. However, this could be a costly mistake – both financially and emotionally, as a burglary can cause a great deal of distress. This time of year, when it gets dark earlier, the risk of a break-in tends to increase as thieves take advantage of the darker evenings. Holiday homes can be an obvious target for a burglar as they may be empty for extended periods of time. Here are some helpful tips that you may want to consider to protect your property. 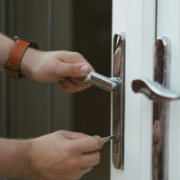 Make sure you have good quality locks on your doors and windows to increase your security, and make sure that they are closed and locked properly. Although closing windows sounds like the most obvious thing to do, some holiday home owners leave them slightly open to avoid damp throughout the winter, when the home is left empty. Not only is this a bad idea, it could also invalidate your holiday home insurance. Even a small opening could be enough for a burglar to gain access. Pay particular attention to ground floor windows, front and back doors, which is where a typical burglar will gain entry. Having an alarm can be a good deterrent for burglars, but it will not stop them from getting in. However, they may try to find an easier target, and it will give your holiday home that added level of security to help put your mind at ease when you’re not around. If your home is in a very rural location with no homes close by, then an alarm may not be as effective as it would be in a more populated area. In this case, you may want to consider other options, such as shutters. You may want to leave your keys nearby when your property is empty, so buying a key safe could be a good option for you. Try and secure your safe somewhere discreet, so it is not obvious to a passer-by. Do not leave your keys above door frames, under mats or plant pots, for guests or workman to access them. This is likely to be where a burglar will look first and could invalidate your holiday home insurance. If you own any outbuildings or sheds, make sure you have quality locks on them to protect the contents. Do not leave any tools lying around, such as garden forks or spades, and put away any ladders, as these can all be used to gain access to your property. If you can put in motion-detecting lights, or have lights on a timer for a couple of hours each evening, this could be enough to deter a burglar. A burglar may be less likely to break into your property if CCTV is visible. There are some types of technology that will allow you to monitor your property in real-time from a PC, iPad or phone, so it could be worth the investment for more protection. Having a neighbour or housekeeper visit your home regularly would be useful so they can alert you if there are any signs of damage or suspicious activity. This may also help to deter thieves if the property looks as though it is occupied more often. Thieves are opportunists, so if you try to make it as difficult as possible for unauthorised entry into your property, the thief is more likely to find an easier target. 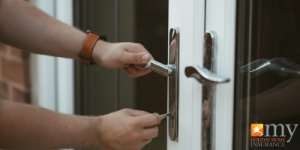 If you have guests, ask them to make sure they secure all windows and doors before leaving the property. These helpful tips could help minimise the stress of a burglary, and can make your holiday home a lot more safe and secure. For similar topics like this, please follow us on Twitter, Facebook & LinkedIn. Are you thinking about buying a holiday lodge? Owning your own holiday lodge and having a beautiful retreat away from the normal everyday life, sounds like a tempting idea. However, buying a holiday lodge could be a confusing and daunting task, especially if this is your first time, so we’ve put together some helpful tips about what you need to consider before making your final purchase. What will your holiday lodge be used for? Do you just want somewhere to relax for the weekend? Are you looking for a second home, which you can enjoy in the summer months? Are you looking to buy a lodge as an investment to generate rental income? These are important questions to ask yourself, as this will ensure you find the right location for your lodge. Having a holiday lodge in Devon or Cornwall, sounds nice, but you need to think about how long the drive will take and whether you could face it. You could be travelling a distance with perhaps pets, elderly relatives or children. It would be good to set a travel limit, making sure that your holiday lodge is situated in an area where you will be able to do the things that you love to do in your leisure time. If you are thinking about the rental potential of your property, a location close to beaches, tennis or golf clubs, sailing or even walking trails would be an advantage. There are beautiful parks in coastal locations throughout the country, so you will have plenty to choose from. If you already know where you would like to be located, speak to the parks in the area so they can give you guidance throughout the buying process. The cost of a holiday lodge will depend on the size, number of bedrooms and the specification, just like if you were buying a house. 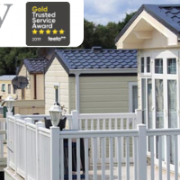 If you are buying a lodge on a park, you may be given a turnkey price, which can include the lodge, fixtures and fittings, parking space, a garden and sometimes even decking. This all really depends on the park, so be sure to check what you will get with your purchase. Where your park is located will also affect the price. If your lodge offers fantastic views, is on a popular park or located near the coast, lakes or rivers, then it could cost you more than one that does not have these spectacular views. Also, remember that there is no stamp duty to pay when buying a lodge! So, you have found the perfect park, what next? You need to consider the times during which the park is open and closed and whether there are any restrictions in place about how long and when you can use the park. Some parks are open all year round, while some close for up to three months in the year. Another consideration should be the additional annual costs you will be expected to pay. With every park being different you need to think about annual ground rent and maintenance charges. You may also need to set aside money for the utility charges and holiday lodge insurance. Consider how long the licence or lease is and what type of warranty the park is offering. Each park should be able to estimate the charges for the year. This really depends on the individual park. If you want to maximise your rental income, then you should consider a park that encourages sub-letting and has good facilities. Some sites do not allow this as they are looking to maintain a neighbourly and secure family environment. If you are looking for a quiet location then it would make more sense not to purchase on a sub-letting park. There are many advantages to owning a holiday lodge: it offers a cost-effective way to enjoy holidays all year round without the need for check-in or check-out. Finding the right location is essential, if you intend to spend a lot of your leisure time getting to know the area. Before you make your final decision, take some time to speak to other lodge owners on the park and find out how their experience has been. For more helpful tips or for similar topics, please follow us on Facebook, Twitter and LinkedIn. Making sure that your holiday home has the right level of insurance cover is essential, as it could be rented out or left unoccupied for days or weeks at a time. 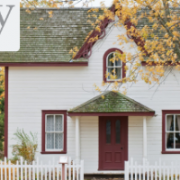 If you’re insuring a holiday home for the first time, or you want to check that you have the right holiday home insurance to meet your needs, then this article can help you to protect your property. Whether your holiday home is a house, a villa, a flat or a lodge, then it’s worth talking to a specialist holiday home insurer. As well as understanding your requirements, you may well find that the insurance is less expensive. Policies differ but your main goal is to protect your home and the contents inside, so holiday home insurance mainly comprises buildings and contents cover. 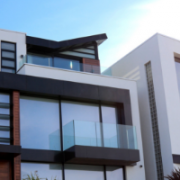 Buildings insurance covers the structure of your property against risks such as fire, storm and flood, and could assist in repairs or building work that may need to be carried out if the property is damaged. You must take into consideration the cost to rebuild your home to make sure you that have the right level of buildings cover. Be specific with your insurer and let them know exactly what you would like covered. If, for example, you these must be specifically added to your policy. Contents insurance can cover possessions inside your home and it’s essential if you are letting out your home – either to friends and family or on a commercial basis. 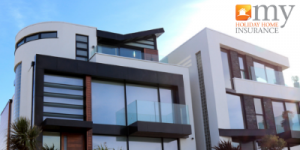 Normal home insurance will cover your family and guests in your home, however if you are renting your property, you face extra risks as a landlord. You must take into consideration the cost of the contents inside your holiday home to make sure you have sufficient cover. Consider all aspects of your insurance! For example, emergency travel cover is included as standard for some countries, which may be a significant cost if you need to visit your property in the case of an emergency. You are also covered for the loss of rental income if you are unable to rent your holiday home for a period of time – for example if it is damaged by flood or fire. What type of property can holiday home insurance cover? There are numerous types of properties that can be covered under holiday home insurance, such as: holiday apartments in coastal resorts, holiday lodges in holiday parks, holiday cottages, villas or houses in the UK or abroad and holiday caravans. Do I need to let my insurer know it will be a holiday home? Yes you do! 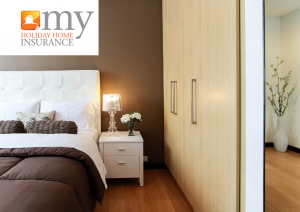 A standard home insurance policy could be invalid if you do not let your insurer know it is not your main home. If your holiday home is left unoccupied for more than 30 days, a standard home insurance policy will not cover you. You must request cover for a property that is not your main residence to avoid non-payment in the event of claim. Making sure you have the right level of cover for your holiday home is essential, so always read the policy documents. Please note that terms and conditions apply. Further information is available on what cover is included with our holiday home insurance policies, and you can download an example policy document and a policy summary of holiday home insurance. Contact us for more information about holiday home insurance, or follow us on Facebook, Twitter and LinkedIn. As summer draws to a close, you should be thinking about preparing your holiday caravan for the winter. If you’re planning to store your caravan away for the winter months, here are a few tips to help to ensure that everything is in working order when you want to get back on the road again next year. Take the time to make regular visits to your caravan, so you can keep an eye on any problems that may occur. Loss or damage caused by escape of water: If your caravan is left unoccupied for more than 48 hours between 1st November and 31st March inclusive, you must ensure that the main water supply is turned off by means of a stopcock at the first available point of entry of the water supply to the caravan and all fixed water tanks and pipes are drained. This is a condition of your holiday caravan insurance. Check your holiday caravan insurance policy for any other conditions relating to winter storage to ensure that you are properly insured. Empty the fridge and clean it with anti-bacterial cleaner. Open the fridge door slightly and leave it open to stop any mildew building up and the door sticking. Protect your caravan from rust by coating hinges with a lubricant such as 3-in-1 oil or WD-40. 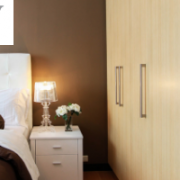 Leave cupboard and wardrobe doors open to aid circulation. You could even put in some dehumidifiers to prevent damage from damp. Pack away any valuables. If you have space in your home to store upholstery, then you should, this is less attractive to thieves and it will keep it damp free during the winter. Clean everywhere thoroughly throughout so that you can make sure that nothing has been forgotten. Leave the windows open while you are doing it to let in some fresh air. Lubricate your window seals to prevent them from sticking when they are opened again, reducing the risk of them tearing or getting damaged. Put your caravan on level ground and try not to leave your tyres standing in the same tread for long periods. Ideally you should turn them every couple of months, checking the pressure to avoid the risk of flat spots on your tyres. Make sure your pipes and guttering are in good order and block any gaps where insects can gain access. Check the roof to make sure there are no leaks or loose joints. Make sure all locks on doors and windows are secure. Ideally, do this a few weeks before you are due to leave the caravan, so you have time to fix any issues that may arise. It’s important that you disconnect your gas supply by turning it off, disconnecting the gas bottle and storing it away safely. Some caravan parks do not allow you to leave your gas cylinders on site, so you may have to find alternative storage. Follow us on Twitter and LinkedIn for more tips on looking after your holiday caravan. You can also have a look through our website for more information.